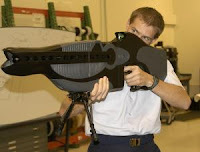 The two devices under development by the civilian National Institute of Justice both build on knowledge gained from the Pentagon's controversial Active Denial System (ADS) - first demonstrated in public last year, which uses a 2-metre beam of short microwaves to heat up the outer layer of a person's skin and cause pain. Like the ADS, the new portable devices will also heat the skin, but will have beams only a few centimetres across. They are designed to elicit what the Pentagon calls a "repel response" - a strong urge to escape from the beam.